Some weeks ago I got a big package with snus shipped to me from Pure Nordic. Pure Nordic snus is manufactured in Denmark but has all the qualities and requirements that a snus needs to be called "Swedish Snus". It's sold in stores in Norway and also on this webpage. 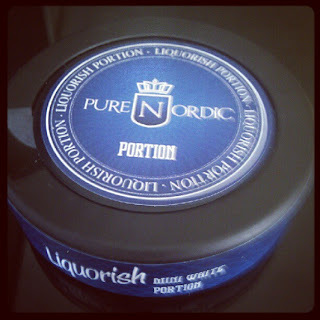 This is my first review for Pure Nordic snus, Enjoy! Sometimes I get these really intense cravings for candy… and not any candy, no… Licorice! I had some troubles with this while staying in the US since licorice is not as common there as in Sweden. Especially Salt Licorice. Anyhow, I got one of these cravings last evening. Luckily I remembered I had some Pure Nordic Licorice stocked up in my fridge for moments like this. I enjoyed a nice white mini portion of licorice snus with a glass of coke… might sound like a crazy combination but it tastes great! This snus is more salmiak flavored then many of the licorice snuses I’ve tried in the past. I love that it has both salty and little hints of sweet notes to it. The flavor comes on strong in the beginning but then fades and just lies there discretely in the background. Luckily for me this snus does not contain that much nicotine compared to what I’m used to…. I would probably not survive otherwise since I eat this snus almost like candy (no of course I do not eat it!). The size of this white mini is perfect for me. It does not drip but whenever I feel like a little more flavor I just lick it with my tongue and get a new taste sensation every time. I really enjoyed this snus as you can tell and I can definitely see myself using this from time to time. Just wish it was a bit easier for us non-Norwegians to get our hands on. But maybe in the future? Now I have to figure out a way to stock up and prepare for my move to LA, because I definitely want this snus with me. Like I said earlier the nicotine does not really do it for me but it’s a great in between snus. I really don’t feel like I need that “rush” with every snus, sometimes it’s more the habit of having something under my lip. The can design is really neat and classic. I love it! It also feels a bit more expensive then other danish snus brands. 1 comment on "Pure Nordic - Liquorish white mini portion review"
Couldn't agree with you more about the habit of having something under your lip- while I usually stick to ES portions sometimes I keep them in for 2hr-3hrs out of habit.